Somewhere in the depth of the Atlantic ocean the three tectonic plates holding the continents of Europe, Africa and America meet. As you might expect, a bit of volcanic activity came about as a result of their meeting, and 9 islands were eventually created. They were discovered and settled by the Portuguese, and are now known as the Azores. A tiny bit of land in the middle of the ocean. Lots and lots to explore and enjoy. 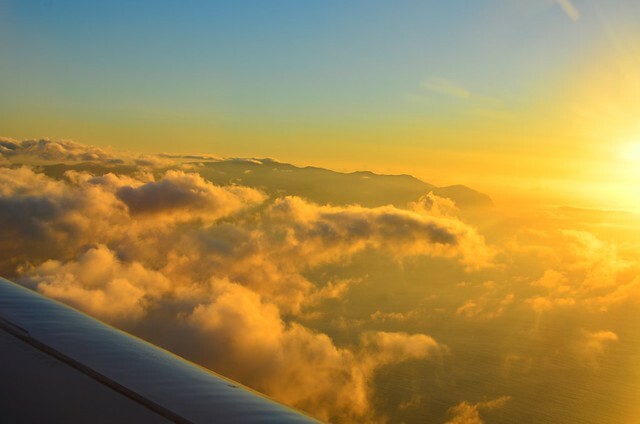 First light over São Miguel island. The flight from Toronto to Ponta Delgada, São Miguel arrives shortly before 8 am local time, and comes with a complementary case of serious jet lag. We were picked up at the airport by our host, Jorge. He was surprised at our scant luggage (carry on only) and we sped off towards our home for the next two weeks — a farm in the centre of the island, close to the fishing village of Rabo de Peixe (which translates as Fish Tail). Lots of animals greeted us there: a pair of extremely friendly dogs, two cats, a few geese, lots of chickens, and a few other birds whose names elude me. Jorge built a small guest house on their property, for hosting visiting relatives and tourists. The guest house was surrounded by banana and apple trees. And we had it all to ourselves. Our hostess Guida offered us breakfast and after getting to know each other and chatting for a bit, Jorge was generous enough to offer us a ride to the city where we arranged for scooter rentals. Past the cow pastures and farmlands, we got on the expressway and were in Ponta Delgada in about 10 minutes. What awaited us was a pair of brand spanking new, white Honda scooters, all fuelled up and ready to rock. Looking to test them out, we headed wherever the wind would take us. 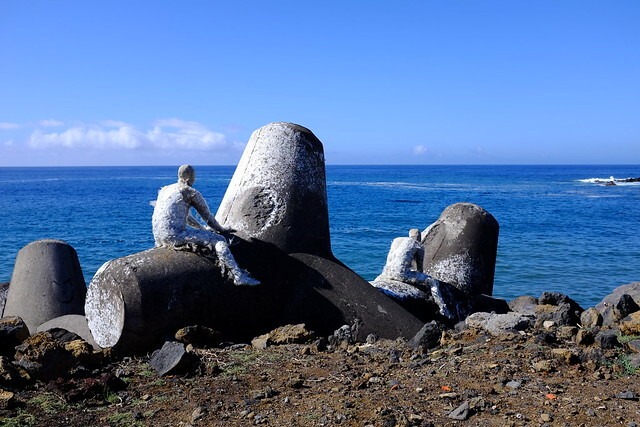 Soon we came across a pair of figures that were contemplating life while roasting on concrete tetrapods on the shore. 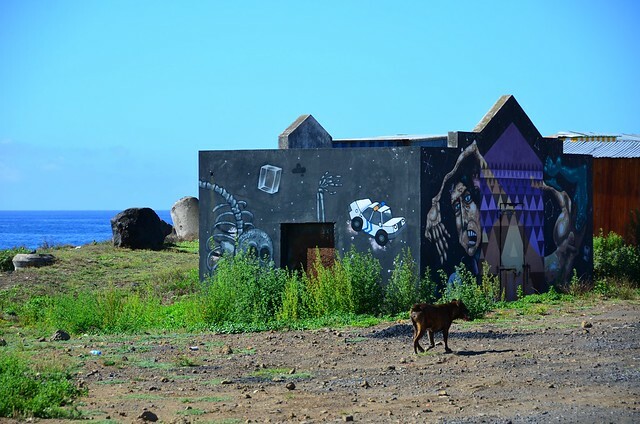 Public art installation in Ponta Delgada. Studying the map while getting baked in the sun. 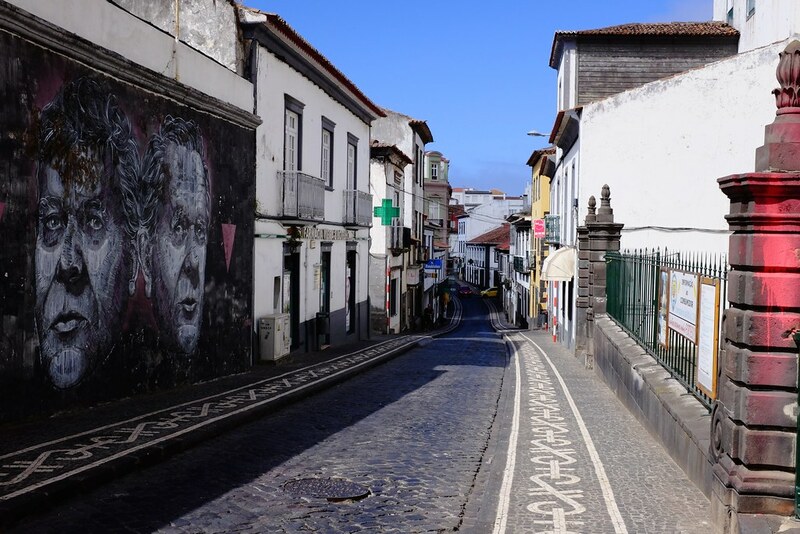 Empty streets on a lazy Sunday, Ponta Delgada. The sun was hitting us quite hard, and the effects of jet lag were kicking in. 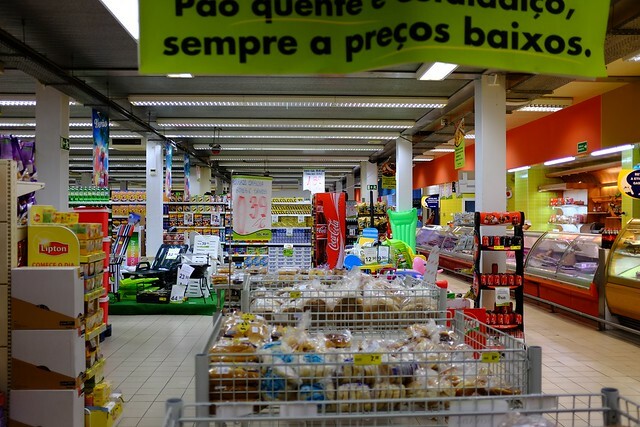 We dropped by a large grocery store on our way back to the farm, and were promptly mesmerized by the new and unusual things, like unrefrigerated milk (UHT processed, very tasty), and the sweet and flavourful breads called bolos lêvedos. Supermarket SolMar in Ribeira Grande. Back in our little house, the sun filled the room through the large windows, and after a small snack we enjoyed a pleasant afternoon nap. When we woke up it was still broad daylight outside, and I realized that we had yet to dip our toes in the ocean. Many of the beaches are helpfully marked on the standard issue tourist map, and the nearest one was Santa Bárbara, in the town of Ribeira Grande. We hopped on our scooters and were there in a few short minutes. While I’m tempted to say that a beach is a beach, and that it looked exactly like you would expect — sand, water and sun — there was something different about it. The waves on the beach were huge! It was quite fun jumping over them, but we were hoping to snorkel as well, and with waves 1-2 m high it did not seem safe to go near the rocks that might harbour some viewable sea life. 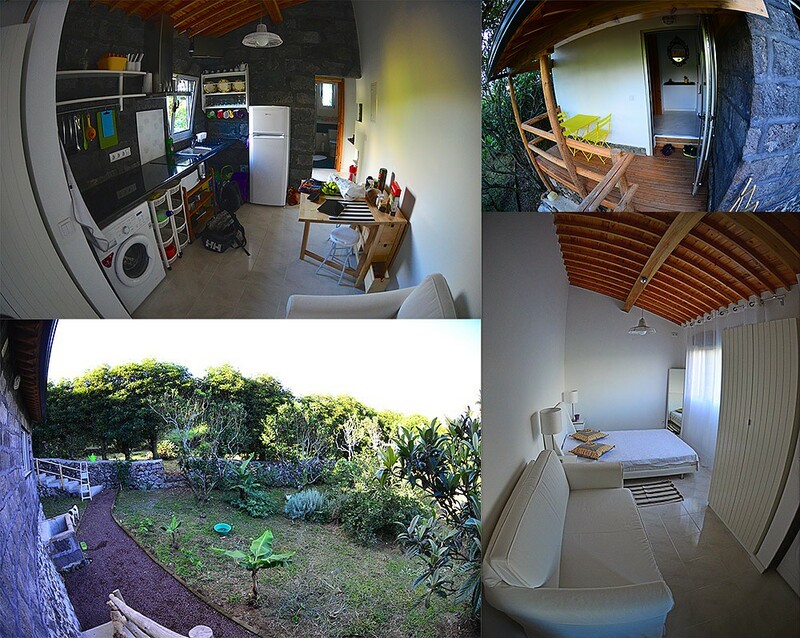 Wanting more, we decided to try a different area entirely — a location on the opposite, southern side of the island, in Água de Pau. Instead of taking the fastest route via the expressway, I decided to try out a smaller road that runs roughly parallel to it, M515/M516. A section of it was unpaved, and our scooters managed it quite well. Passing the green pastures with cows grazing, with hydrangeas and volcanic rocks separating the fields, with foliage covered mountains towering near and far — it was a real pleasure and a theme that continued wherever we went on the island. Although I am a natural born navigator and can typically find my way around a new location with my eyes closed, the path from the main road to the beach in Água de Pau proved a bit difficult at first. The town sits on a hill, and the road winds and turns quite a bit as it descends to sea level, occasionally turning into a one-way path. After we passed a small group of locals for the second time in our attempt to find the right way, one of them offered to help. Of course, he only spoke Portuguese, but since I knew the magic word praia, it was enough to set us straight. 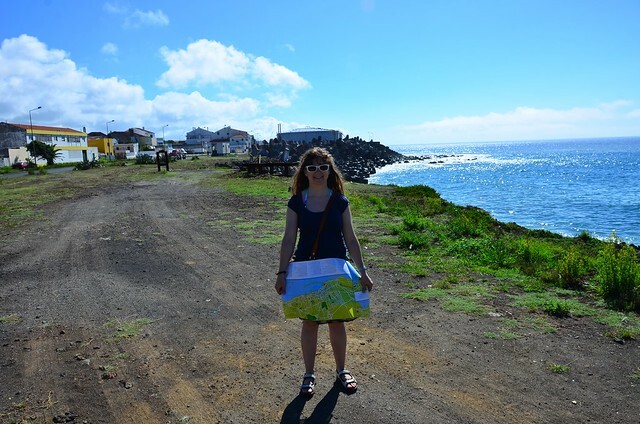 This beach turned out to be much smaller than Santa Bárbara, but similarly harassed by waves. Instead of trying to swim in it, we climbed a rocky formation just off the shore that offered a beautiful view of the sea as the sunlight was getting more and more purple. And thus we met our first Azorean sunset — in the moment, not even bothering for a photo.